When discussion about drilling for natural gas in our neighborhood began a few years ago, many understandably saw dollar signs in their future. 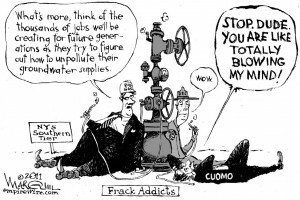 But it turns out that, along with the environmental dangers, there are many financial perils that come with fracking. These were far from clear when the landmen first showed up at our doors, and they might make the whole enterprise a lot less attractive if it ever gets going here. In Bradford County, Pennsylvania, for example, hundreds of farms and other properties are reported to be encumbered with Mechanic’s Liens. This resulted when many of the drillers developed financial problems due to the low price of gas. They end up operating at a loss. As drillers go broke, some local contractors and suppliers don’t get paid, so they seek and get Mechanic’s Liens on the assets of the drilling companies. Those assets include their gas leases. Suddenly, the landowners, who were looking for gas royalties to supplement their incomes, find themselves without clear titles to their properties. Now, if they should want to sell the farm, the drilling company’s creditors will be first in line to collect on their debts, and the landowners could conceivably end up with nothing. The unsettled state of the insurance market threatens landowners with other unanticipated liabilities. For example, if you lease your land and the driller is faced with civil or criminal penalties for environmental damages or a gas explosion, as owner of the property, you may be considered responsible for damages. Your Homeowner’s or Farmowner’s insurance will not cover such heavy industrial activities. Insurers like Nationwide and State Farm have said that their policies do not cover damages caused by fracking. Even if you haven’t signed a lease, you may be liable for damages. In the dead of night several years ago, the New York State Legislature passed a compulsory integration law. If 60% of the acreage in a drilling unit (up to a square mile) is leased, the remaining unleased landowners may be legally obliged to participate in the drilling unit. The companies may drill under your property and take your gas (and pay you a lot less than they will pay the leased landowners). If, in the course of drilling operations, an aquifer is penetrated and water contaminated, you may be liable for damages as a participant in the drilling unit, even if you never signed a lease and never wanted the drilling at all. Both leased and compulsorily integrated landowners in a drilling unit may also be liable for the cost of processing gas and the construction of gathering pipelines to take the gas to market. So those costs will be deducted from your share of the well’s revenue before you ever see a dime. 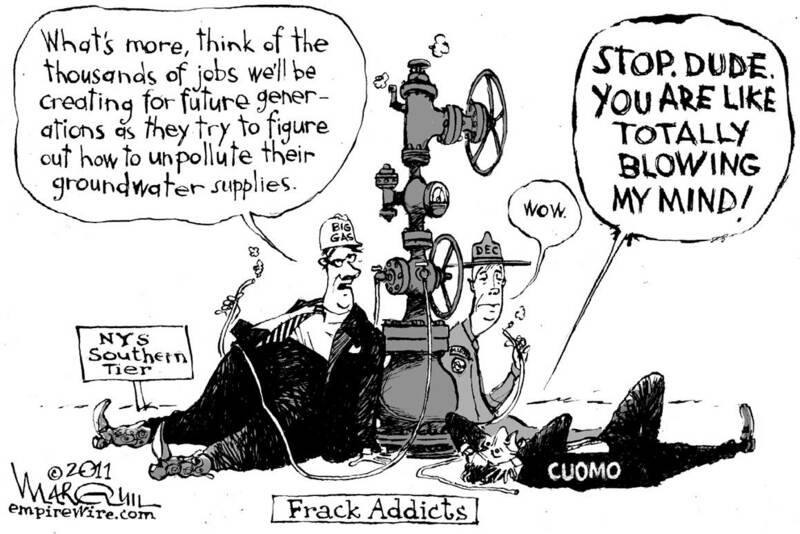 Farmers have good reason to worry about the future of their livelihoods should fracking come to New York. Dairy production has fallen in the Pennsylvania counties at the center of fracking activity. Last December The Nation carried an article by Elizabeth Royte called Fracking our Food Supply. For many property owners along the proposed route of the Constitution Pipeline, their homes and acreage are much of their net worth. Along the swath cut by the pipeline, property values will fall dramatically, and net worths will drop accordingly. Don’t forget, that steel pipe will have been purchased from the lowest bidder. In the event of a pipeline explosion (so common that we read of them weekly), a 30-inch pipeline like the Constitution, operating at the pressure that Cabot/Williams has proposed, has a kill radius of 3,500 feet. That’s a circle of fire, death and destruction nearly a mile and a half across. What will the market value be of a property within that circle? Will the Pipeline offer enough for an easement to make up for the owners’ financial loss?